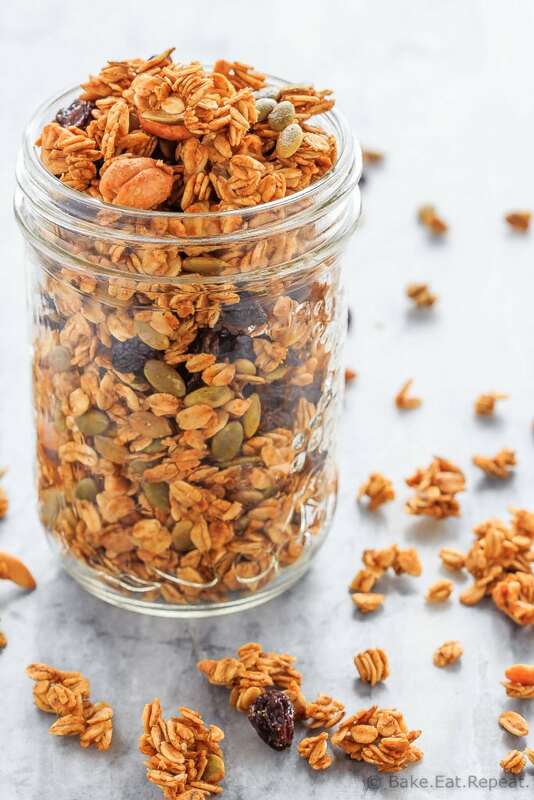 This homemade pumpkin spice granola is so easy to make – pair it with some yogurt for the perfect healthy breakfast or snack! Homemade granola is a favourite snack at my house. I love it, my kids love it … and my husband will occasionally eat it. It’s all right that he isn’t a huge fan of granola though, because the rest of us make up for it. When I make granola my kids are always suddenly starving as soon as they discover it. It can be minutes after a meal, but if they realize there’s homemade pumpkin spice granola available, they will insist they’re still hungry. That’s how much they enjoy this homemade granola! I’m with them. Greek yogurt and some homemade pumpkin spice granola is pretty much the perfect breakfast, lunch or snack in my mind. The kids love taking yogurt with granola for lunch at school – add some fresh berries and they will make parfaits with it, or eat everything separately, depending on which kid it is. They’ll also eat it for breakfast or an after school snack. As you can imagine, a batch of granola doesn’t last too long here! Between the kids and I, it’s usually gone in about a week. 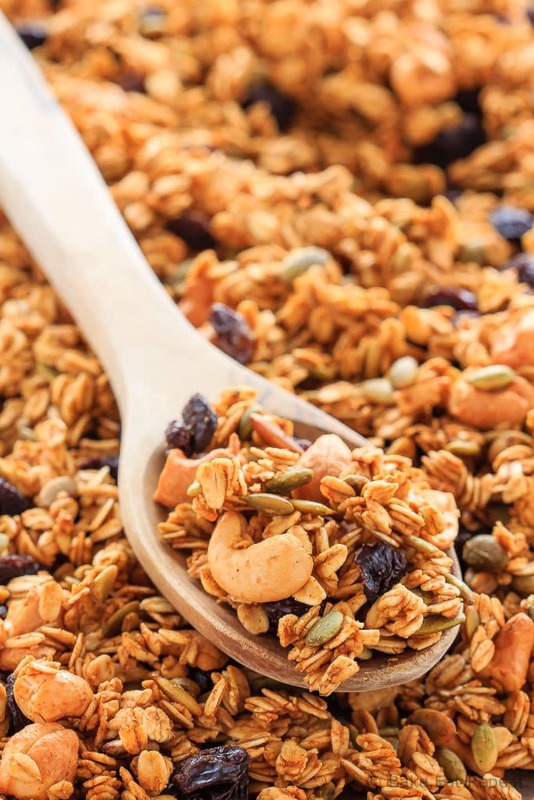 It’s a good thing that this granola is so easy to make (which is one of the reasons I love homemade granola so much!) – it literally takes only a couple of minutes to toss the ingredients together. Then all you need to do is spread it out on a couple of baking sheets and bake it for an hour and fifteen minutes. After it cools it will stay crunchy for weeks in a sealed container at room temperature. You know, if it lasts that long. But if your family loves granola as much as mine does – it probably won’t! 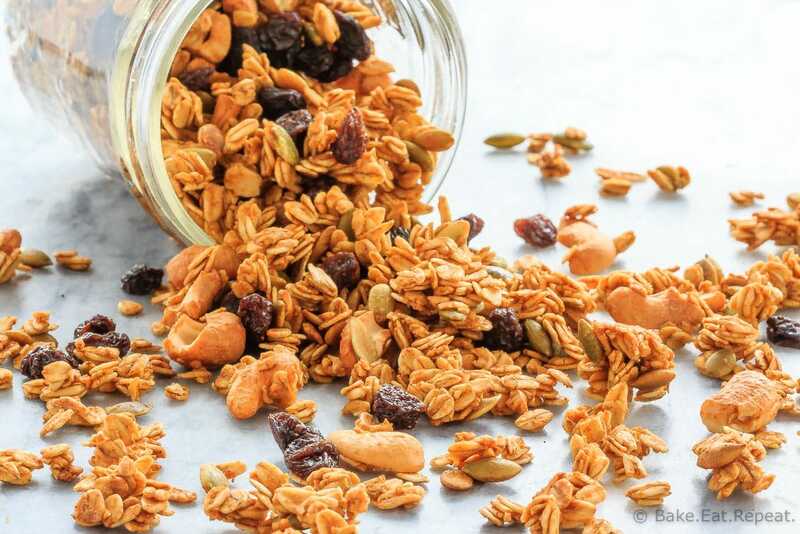 this granola is easily adaptable if there’s something in there you don’t like – change the cashews to almonds, use dried cranberries instead of raisins, honey instead of maple syrup – make it your own! 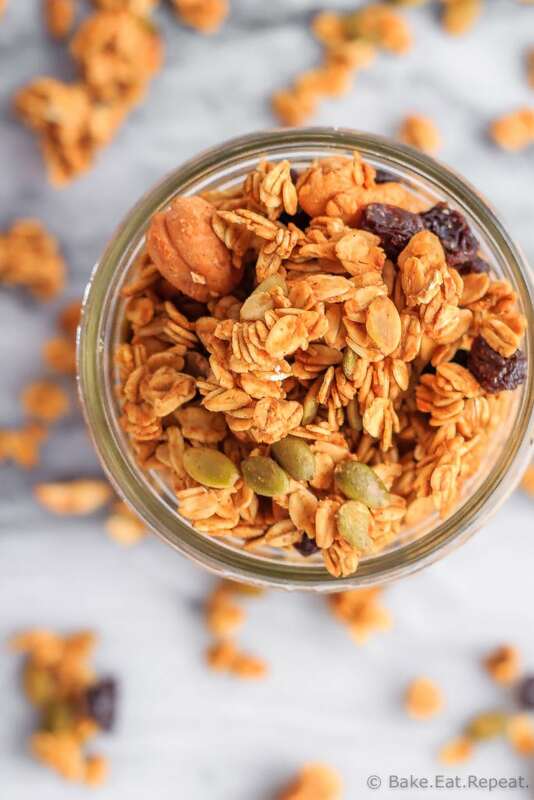 I’ve also shared this Pumpkin Spice Granola recipe over on Food Fanatic. This post contains affiliate links, meaning that if you make a purchase through these links, I may receive a small commission. Did you enjoy this post? Get FREE, easy to follow recipes that your family will love! We are making this right now! Wish me luck! ;) I'm so excited to eat this. The fiber content looks amazing. It's healthy but really yummy (I'm guessing...if I do it right!). BTW, we added the dried fruit (we used Craisins) to the dry mixture. I think it was left out. I'll tell you how it goes! Oops...they go in at the end! Oh well. Yeah....they might taste a bit burnt if you baked them! Hopefully not though - it's a pretty low temp! :) Hope you enjoy the granola! Get FREE, easy to follow recipes that your family will love - straight to your inbox! Content Copyright © 2019 · Bake. Eat. Repeat. Join my mailing list and receive FREE, easy to follow recipes your family will love!